From Medicom Toy. 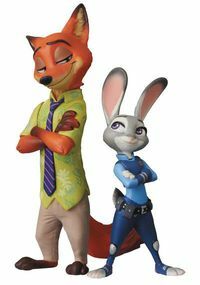 From the popular Disney film Zootopia comes an Ultra Detail Figure set of the two main characters! Judy and Nick have been recreated side by side, looking at each other with a smile. Be sure to add them to your collection! Legal Notice: Entire contents trademarked (® or TM) and copyrighted (©) 1986-2019 by Things From Another World, Inc. and respective copyright and trademark holders. All rights reserved. Page rendered at 2019-04-19 11:30:57 in 0.172 seconds.